This house dating from the seventeenth century is the towns oldest surviving place of worship. Early Quakers in Banbury suffered an extraordinary degree of persecution; in 1654 Anne Audland was imprisoned for several months in Banbury Gaol, a place in which lived frogs and toads and other individuals who were on fire with the spirit disrupted church services. Richard Farnsworth one of the national leaders of the movement was sentenced to six months imprisonment for failing to doff his cap to the mayor of Banbury. Other Quakers were similarly punished for failing to acknowledge Lord Saye and Sele. His lordship is said to have been so outraged by the sect that he described them as,falling down, foaming at the mouth, quaking and making unnatural gestures. The Quakers built their first meeting house in 1657. 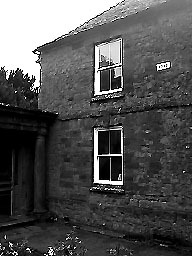 Edward Vivers, a local leader who built the pargeted house in the High Street, now occupied by a travel agent, helped purchase the land for the existing structure which has deeds going back to 1664. 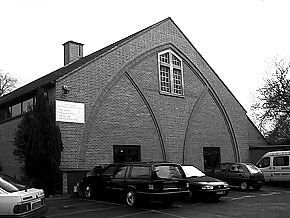 This interesting modern building was put up in 1973 when the Baptists moved from their premises in Bridge Street . Set into a low brick wall in the car park is a stone cross possibly from the roof of an earlier chapel on the site.The Presbyterians occupied a barn close by and in 1716 built a chapel where John Wesley preached in 1784. The site was taken over by the Unitarian Church in 1850. 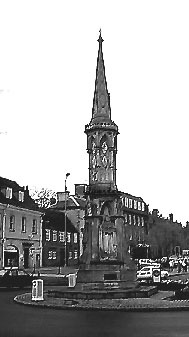 During the middle ages Banbury had three crosses: the High or Market Cross which was erected in Cornhill adjacent to the market place, the Broad or Bread Cross which stood at the east end of Butchers Row and the White Cross which lay at the far end of West Bar. 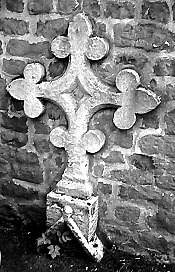 The High Cross was destroyed in 1600 at the instigation of local puritans. You can read the text of the short performance staged on July 1st.2000 to commemorate the attack. 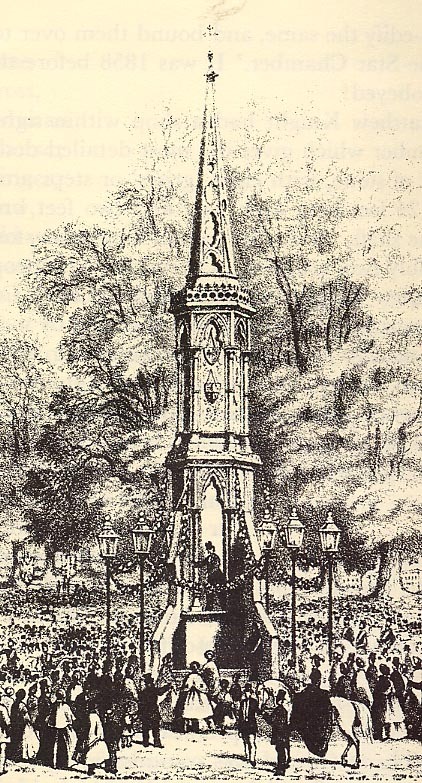 The cross which now stands at the junction between Horsefair and South Bar was put up by subscription following the wedding of the Princess Royal to the Crown Prince of Prussia in 1858. It was designed by J. Gibbs of Oxford and echoed the designs of the Eleanor crosses erected in the thirteenth century by Edward I to mark the resting places of his wifes cortege as her body was carried back to London. For the coronation of George V further statues were added in 1914. These were of Victoria, Edward VII and George himself but such was the anti-German feeling at the time that elements referring to the Prussian Royal family were torn out only to be reinstated when the cross was repaired in 1977. Joseph Parker first preached in Banbury in 1853 when he joined the Independent Chapel and was reported to be a "sensation. By 1856 he had organised the building of a new chapel partly in the style of a Greek temple. He caused a near riot when he attacked those who went out for Sunday trips on the train as the dirtiest, silliest, laziest and poorest of the working population! 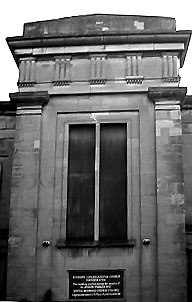 Worship continued until the early 90s and the building stood derelict for some time before being sold off for conversion to a restaurant.